Twenty six years later, it is time to reexamine a benchmark date in the history of the Christian community of Lebanon. It was January 31, 1990, when the two most powerful forces in the then-called "East Beirut enclave," which was in reality the last free zone of Lebanon since 1975, clashed, precipitating a destructive war that flamed for the following ten months, after which the "last zone of freedom" collapsed and a quarter of a century of occupation and terror ensued. That day should be part of historians' work now, but too many questions obstruct a clear and calm discussion of that tragic day and the months that followed to allow for academic analysis. First and foremost, the players who were in command of the civil war that plagued the East Beirut enclave are still active in politics and have yet to reconcile the events of that period—even though they have reconciled among themselves. And many questions have yet to be answered by the commanders who led the two camps of the war; and unless these questions are answered, academic inquiries will be stymied indefinitely. More important is the reality that war produced. The matters over which that conflict was waged have not been resolved, particularly regarding the destiny and future of the Christian community of Lebanon—it remains much more obscure today than it was even then. For some, it seems the main issues were swept under the rug. And more dramatically, the community, and the country as a whole, have been living with the consequences of the collapse of the free areas—despite the brief moment that seemed to bring a glimpse of hope during the Cedars Revolution fifteen years later (10 years ago). Today, the Republic of Taif, the power that defeated the pluralist and federal republic the Lebanese Christian resistance wanted to achieve, is still in power. The Syrian army may have withdrawn, but the second “axis” army, Hezbollah and its allies, have seized the country's defenses and national security. A Cedars Revolution surged, but it was rapidly abandoned by its politicians and crushed by the axis. In short, the community today is at its lowest—if the benchmark was January 31, 1990. Before that internal civil war, there were free areas in the heart of Lebanon from which an international initiative and national efforts could have resumed the liberation. Since that conflict—and as of October 13, 1990, free areas are no more. Fifteen years later a mass uprising created an alternative energy upon which a partial liberation took place. 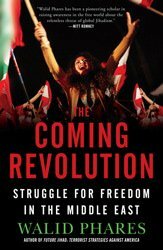 But since no free zone was available, Hezbollah was able to rapidly reverse the revolution. Before the civil war of 1990 in East Beirut, there was a consensus, patiently built since the Lebanese Front convention of 1976, that a community had a right to demand national representation and protection with international support. But the crumbling of the Christian resistance movement in 1990 shot down that international legitimacy. Since then, politicians talk about "Christians' rights," but within a system that does not provide them the protection of a community under international law. Last but not least, the community then had the means to defend itself so that its position at the table of negotiations could be taken seriously. Now it does not. All it has are old videos of acts of bravery of a nation under attack from a quarter of a century ago, reminiscent of a time long-gone. And all the free Lebanese coalition known as "March 14" has to claim? Better quality videos from massive demonstrations by civil society from fifteen years ago. That is all. I personally witnessed the era leading to the day that broke the backbone of the Christian community in Lebanon. I suffered unspeakable losses during the following months, as did most people living between Sodeco (Beirut) and Madfun (north Lebanon). Our losses are part of being born Lebanese Christian and refusing to leave a land bloodied by a decade and a half of violence. The losses may be ours, but the defeat of a people and its abandonment to its fate, leave wounds that won’t be evaporating anytime soon. That day, the war that ensued, the breakup of a nation, the pain that grew for almost three decades, and the inability to rise again because of the consequences of that unnecessary and irresponsible war—this entire old tragedy is, unfortunately, part of the present, not just memories of the past. A people was driven outside of its identity, its resistance disarmed, and its present remains unappealing and its future uncertain. The shadow of January 31 is still here at its 26th anniversary, not only because of what happened that day, but because of where the community finds itself today. The events of January 31, 1990, between the Lebanese Army and the Lebanese Forces may seem small in comparison to the horrors of the wars surrounding Lebanon for the last few years, from Syria to Iraq to Libya and Yemen. But their effects on the Christian community and on Lebanon were titanic. Had they not happened at all and had the leaders and contending parties at conflict avoided that tragedy, the road for the community would have been radically different. Had they united then, as some are attempting to do today, many would not have died—and the wounded would have been spared. Many would not have emigrated and an alternative future would have been lived for the past 25 years. This is why that day of infamy cannot and should not be swept under the rug as a price for political expediency. It should be studied, analyzed, learned from, and what was destroyed should be restored. If time cannot be recaptured, at least the future can be built on these hard lessons and moved in a different direction, certainly not the one caused by the fratricide war of January 31, 1990. What was lost was a free area. That’s the bottom line. What we have learned is that without freedom there cannot be a future for Lebanon. Politics under the diktat of occupation or terror are only mirages of success, illusions. Reality is harsh for the vanquished as the victors are the ones who write history. 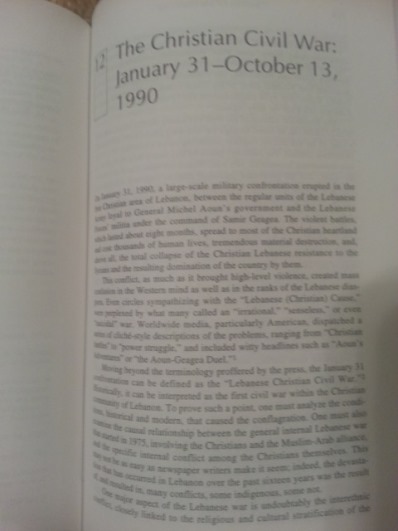 For the last 25 years history has been written by the victors of the Lebanon war. January 31 gave them that victory. It has to be reversed and a new path chartered for that wounded small nation. In the past thirteen centuries there were highs and there were lows, but Lebanon was always conscious about its identity and understood where its future laid. One thing has, however, been missing since 1990: Who the community is and what it really wants.